Where do Mangoes come from? (Heaven, right?) How did mangoes get to the USA? The real answers to both questions make kind of a long story. And thanks to Julia Morgan’s efforts in decades past, I can tell you the story today. However, since this is a blog, here’s an abbreviated version of Julia’s original research. And if you’ve forgotten your geography, no problem. Just click below on any map for a quick visual review! A) Mangoes are native to southern Asia, particularly eastern India, Myanmar (formerly Burma), and the Andaman Islands. B) Mangoes have been cultivated and loved since Ancient times. C) Buddhist monks likely took mangoes on voyages to Malaya and eastern Asia in the 4th and 5th Centuries B.C. D) The Persians introduced mangoes to East Africa around the 10th Century. E) Mangoes were cultivated in the East Indies before the earliest visits of the Portuguese, who introduced them to both the Brazilians and West Africans early in the 16th Century. F) After becoming established in Brazil, mangoes were carried to the West Indies, first planted in Barbados about 1742 then later in the Dominican Republic. G) Mangoes reached Jamaica about 1782. H) Mangoes have been grown in Puerto Rico since about 1750. I) Mangoes showed up in Mexico (from the Philippines and the West Indies) in the early 19th Century. J) In 1833, Dr. Henry Perrine shipped seedling mango plants from Yucatan to Cape Sable, Florida, but the plants died after he was killed by Indians! 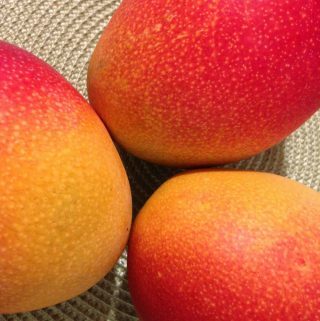 K) Mango seeds were imported into Miami from the West Indies by a Dr. Fletcher in 1862 or 1863. Two trees grew to large size and one was still bearing fruit in 1910 and is believed to have been the parent of the ‘No. 11’ mango which was planted for many years thereafter. L) In the late 186o’s, mango seeds were planted south of Coconut Grove, Florida; the trees prospered until around 1909, producing the ‘Peach’ or ‘Turpentine’ variety. M) In 1872, a seedling of ‘No. 11’ from Cuba was planted in Bradenton, Florida. In 1877 and 1879, W.P. Neeld made successful plantings on the west coast but they didn’t survive the January freeze in 1886. N) Hawaii’s earliest record of the mango was the introduction of several small plants from Manila in 1824. Three plants were brought from Chile in 1825. In 1899, grafted trees from Indian varieties were imported. Seedlings became widely distributed over the six major islands. O) In 1885, seeds of India’s ‘Bombay’ mango were brought from Key West, Florida to Miami, Florida and resulted in two trees which were productive for at least 25 years. Q) P.J. Wester conducted many experiments in budding, grafting and inarching from 1904 to 1908. R) Shield-budding on a commercial scale was achieved by Mr. Orange Pound of Coconut Grove, Florida in 1909. Shield budding was a pioneer breakthrough which gave strong impetus to mango growing, breeding, and dissemination. S) From the early 1900s onward, enthusiastic introduction of many mango varieties by the U.S. Department of Agriculture’s Bureau of Plant Industry and nurserymen followed; the mango grew steadily in popularity and importance! T) The Reasoner Brothers Nursery imported many mango varieties and was largely responsible for the ultimate establishment of the mango on the West Coast. U) A mango seed from Guatemala was planted in California around 1880: a few mango trees have borne fruit in California’s warmest locations with careful protection from low temperatures. V) Altogether, the U.S. Department of Agriculture made 528 introductions from India, the Philippines, the West Indies and other sources from 1899 to 1937. Propagation of new varieties has been going on ever since. X) With seeds brought from India, Ceylon, the East Indies and the Philippines, mango cultivation in Australia began among early settlers in North Queensland. In 1875, 40 varieties from India were set out in a single plantation. Over the years, commercial production and culture has extended to subtropical Western Australia. Y) There is no record of the introduction of the mango into South Africa but a plantation was set out in Durban about 1860. Z) Today, Florida remains the USA’s center of mango research and cultivation. Explore Mango Varieties in Pictures – What Could be Better?? Mango Calories…How Many Are There Anyway? 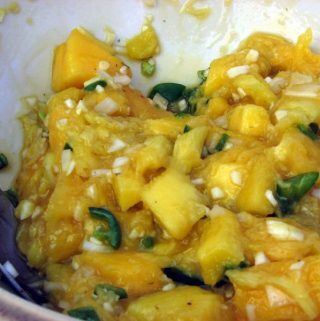 Previous Post: « Ataulfo Mango – Tasty, Tasty, Tasty! !